Is it America's moral duty and global responsibly to make sacrifices in our own lives to help other people in other countries to raise their standard-of-living? Some people will use that argument to defend their practices of offshoring jobs overseas to low-wage countries, making it appear that somehow our "job creators" are doing something noble for humanity. "In Asia, the American-led open trade era has created the greatest reduction in poverty in human history. The Pacific trade deal [the TPP trade agreement] would lift the living standards of the poorest Asians, especially the 90 million people of Vietnam." Nike has 345,000 workers in Vietnam working in 67 factories paying young women 42 cents an hour to make shoes selling for $150 in the United States (not counting all the other factories they have outside the U.S.). So it's odd that Obama decided to give his speech on trade at Nike's headquarters. Meanwhile, the U.S. has 67,161 less factories today than it did in 1997. "During the 1990s, all our experiences have caused us to really believe in the benefits of international trade. The uplifting of impoverished people, the better values for consumers in industrialized nations, and most of all, the increased understandings between peoples of different cultures." 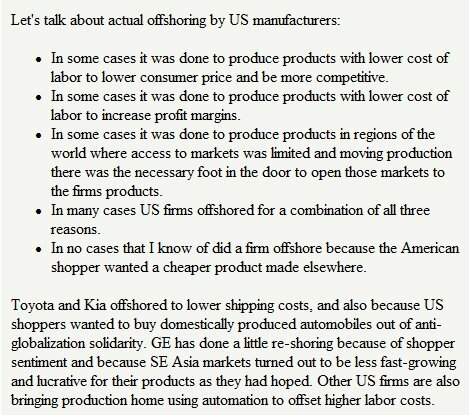 As I noted in a previous post, this corporate strategy allows for the cheapest labor costs and bargains with the worst governments. The result? Companies like Nike can keep manipulating their stocks, dodging corporate taxes while making shoes for only $1.60 a day — just so that Nike's CEO can earn $96,000 a day. The U.S.-based CEO of one of the world’s largest hedge funds told me that his firm’s investment committee often discusses the question of who wins and who loses in today’s economy. In a recent internal debate, he said, one of his senior colleagues had argued that the hollowing-out of the American middle class didn’t really matter. “His point was that if the transformation of the world economy lifts four people in China and India out of poverty and into the middle class, and meanwhile means one American drops out of the middle class, that’s not such a bad trade,” the CEO recalled. Just like Bill Gate's and Bill Clinton's foundations, some CEOs of American-based multi-national corporations claim they are are offshoring jobs overseas to low-wage countries, not because it can generate much higher profits at the expense of American workers, but because of humanitarian reasons — to help others in this world of economic globalization — and that greed has nothing at all to do with it (even though U.S. corporations now have over $2.1 trillion in overseas profits sitting idly offshore). "China's middle-class is now the biggest in the world, and growing much faster than America's, according to research by Credit Suisse. There are 109 million Chinese with wealth of between $50,000 and $500,000. Since 2000, twice as many Chinese as Americans have joined the middle class." In his last year of office, President Bill Clinton called on Congress to make normal trade relations with China permanent. So legislation was introduced to the House on May 15, 2000 by Rep. William Reynolds Archer (R-Texas) saying that permanent normal trade relations (PNTR) with China was a top priority, and was vital to the U.S. agriculture market (to gain access to a market with one-fifth of the world’s population). The other crucial point that was made was that the involvement of the U.S. was needed "to help the workers of the People’s Republic of China to lead better lives". 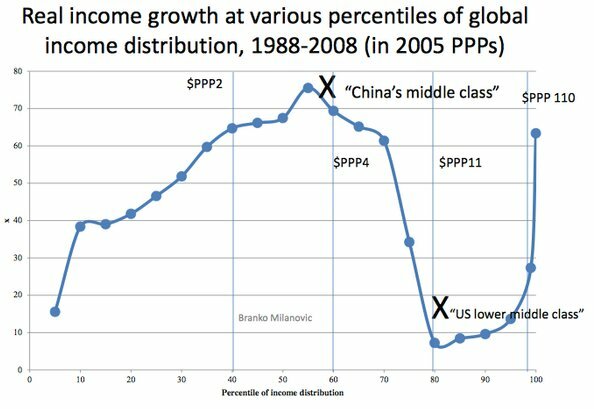 Since then, millions of Chinese people have been lifted up into the middle-class. The economist Paul Krugman provides the graphic below and writes, "There have been huge gains for what we might call the global middle — largely consisting of the rising middle-classes of China and India. Now for the bad news: Between these twin peaks lies what we might call The Valley of Despond. Incomes have grown slowly, if at all, for the advanced-country working classes." So some Americans were forced from the middle-class in the U.S. so that people in other countries can move into their middle-class. Have we sacrificed the few to save the many? Who decides? Our CEOs? Members of Congress, despite how their constituents might feel, just jammed fast-tracking the TPP trade agreement down our throats. Conclusion: If our findings are interpreted as causal, higher unionisation and minimum wages can help reduce inequality. However, this is not necessarily a blanket recommendation for higher unionisation and minimum wages. Other dimensions are clearly relevant. The experience with unions has been positive in some countries, but less so in others. For instance, if unions primarily represent the interests of only some workers, they can lead to high structural unemployment for some other groups (e.g. the young). Similarly, in some instances, minimum wages can be too high and lead to high unemployment among unskilled workers and competitiveness losses. Deciding whether or not to reform labour market institutions has to be done on a country-by-country basis, taking into account how well the institutions are functioning and possible trade-offs with other policy objectives (competitiveness, growth, and employment). Finally, addressing rising inequality will likely require a multi-pronged approach including tax reform and policies to curb excesses associated with the deregulation of the financial sector. Our "job creators" have been creating jobs overseas (to lift others out of poverty, putting more Americans into poverty) because they say it's the moral and humanitarian thing to do — because the CEOs and members of Congress say so (and it's not because of corporate greed). So remember that every time you buy an iPhone or a pair of Nike shoes: You'll be giving to charity. It would also be interesting to know, besides just jobs and wages, what percentage of U.S. earnings of Microsoft and Walmart are being used for humanitarian reasons abroad. Recently the EU slammed corporate tax dodgers. Is Apple next? Maybe if the U.S. cracked down on our own congressionally-enabled corporate "tax avoiders", maybe the extra tax revenues could be used for humanitarian purposes here at home. After realizing how unpopular the TPP trade agreement was among Democratic voters, Hillary Clinton (after years of promoting it) flip-flopped — and is now against it. Whereas Senator Bernie Sanders was ALWAYS against it. And that might help explain why the corporate media almost always refers to Senator Bernie Sanders as "a democratic socialist" or "the self-proclaimed socialist" or "an avowed Socialist" — much more so than they describe him as "a progressive Independent" — or just "the senator from Vermont". On the other hand, the corporate media never describes Hillary Clinton as "the neoliberal free-trading capitalist" or "the self-proclaimed moderate". The media usually just refers to her as "the Democratic front-runner". Why is that? Maybe it's because America's 6 giant media corporations support the TPP trade agreement ( and why they have mostly ignored the issue). And that's also most likely why the media pundits said Hillary won the last Democratic debate, despite the fact that all the online polls and focus groups showed Bernie had won. Comcast bought NBCUniversal (NBC, MSNBC, etc.) on March 19, 2013. Afterwards, Comcast ordered MSNBC to remove anti-TPP hosts — and that's why they fired Ed Schultz. In his very last show on MSNBC, Ed bashed Hillary Clinton on the TPP trade deal. [From Global Research --> TPP, TTIP and TISA: How the Media Misrepresents Obama’s Fast Tracking Secret International Trade Deals]. The Center for Public Integrity asked Joe Trippi (a Democratic campaign consultant): "What do you think would happen if Bernie Sanders beats Hillary Clinton in Iowa?" He replied: "The entire Democratic establishment would come out of the woodwork to stop Bernie Sanders from being the nominee. The establishment fervently believes that a socialist cannot be president of the United States." But yet, a self-proclaimed moderate and neoliberal free-trading capitalist who supported the TPP trade deal (such as Hillary — or even Obama) would be perfectly acceptable to the establishment Democratic party machine. Why is that? Especially since the "humanitarian" Democrats claim to be the party who represents workers. With friends like that, who needs cruel enemies? That claim that somehow labor arbitrage is a humanitarian mission is the biggest insult to working people of all time. Up there with let them eat cake level of lie. These trade deals don't just ship jobs overseas, but put peoples in slave labor conditions and kill local economies. There are no labor and environmental standards in these deals but even that wouldn't stop it. (What does Nike think of the TPP trader deal?) "The U.S. agreement with Vietnam requires the country to legalize independent unions and allow unions to strike and contains a provision that allows the US to "withhold or suspend tariff reductions for Vietnam if Vietnam does not comply with its commitment to provide the right to form labor unions across enterprises and at higher levels within five years." (Maybe Nike doesn't have anything to worry about.) "The Vietnamese government has tolerated wildcat strikes as a way for workers to let off steam and to demand raises... Vietnam does not have a large underground labor movement that might quickly benefit from legalization. Vietnam's tolerance of wildcat strikes may have discouraged the formation of such a broader movement." Nike should be giving our Vets jobs in the U.S. -- or set up their corporate headquarters in Hanoi.